The number of cichlid species identified in the wild is well over 1,000 and biologists think that many more are waiting to be discovered. Cichlids are found in many locations throughout the world and include such favorites as the freshwater angelfish, the tiger oscar fish and the jack dempsey cichlid. They can be quite fascinating and territorial, especially when they pair off and start to spawn. Some will tolerate tank mates and some can only be kept as lone individuals or in very aggressive species only tanks. Some retailers and breeders tend to keep them overcrowded in display tanks to try and limit the aggression and indeed it does seem to work. However, there could be many factors at play in this scenario. The water quality could be very poor, likely high in ammonia (and possibly nitrites) thereby causing them to appear more docile. theory is that a crowding situation prevents a lone fish from becoming dominant over a few. There are just too many other fish to dominate in a crowded tank. 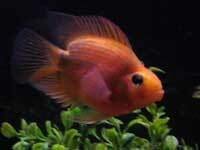 Once you get a few of them acclimated and at home in your aquarium the situation could be completely different. 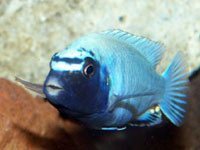 Use caution when selecting tank mates and due your research before getting any of these cichlids to make sure you can meet their requirements. The Afra Cichlid is a brightly colored mbuna from Lake Malawi Africa. Can be temperamental with other species when they pair off. A popular cichlid that needs a larger aquarium. Really pretty shades of blue depending on the aquarium lighting they are under. Colorful cichlid that likes hiding places and live plants. One of the most commonly kept cichlids. They are great parents and fairly easy to breed. A dwarf mbuna cichlid that needs to be kept in groups. 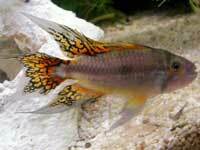 The ultimate freshwater tropical fish species perhaps, it's definitely one of the prettiest and can be considered challenging to keep long term. 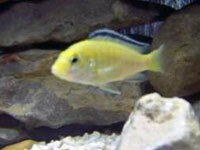 Another great cichlid that is an excellent parent to it's young. Named after the famous prize fighter, these cichlids need larger tanks. A big cichlid (up to 21 inches) that needs a big aquarium. The Jewel cichlid can get aggressive with tank mates (like many cichlids) when they pair off. 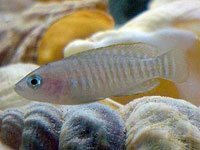 Use caution when mixing with other kenyi (must only be in ratio of 1 male to 2+ females) and not with other fish from Metriclima group due to aggression. Not compatable with other types of fish, not a community fish. Another one of the easier to breed cichlids. Often sold to new hobbyists that should now better. Oscars need larger tanks than most hobbyists can provide. An interesting hybrid cichlid that needs some hiding places and an established tank. The Polit Cichlid is a highly aggressive mbuna from Lake Malawi Africa. Awesome looking cichlid that needs to be slowly acclimated and fed a high quality diet. A large and mean cichlid that needs a large tank. Gets to around 5 inches in size and considered one of the less aggressive cichlids. Endemic to Lake Malawi. A dwarf mbuna cichlid that gets to about 3.4 inches as adults. The common severum, needs at least a 55 gallon or larger. Multies are a special type of cichlid for many reasons. The first reason is they are shell-dwellers, or Shellies, which means that they live and breed in shells. 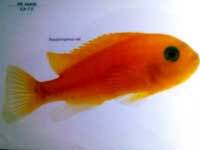 The Yellow Lab Cichlid is a brightly colored mbuna from Lake Malawi. 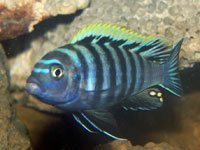 The zebra cichlid also known as the Malawi blue or Malawi zebra cichlid and it originates from East Africa in the Lake Malawi.